Ascend Armory: Free titanium .308 muzzle brake with select AR10 receiver sets and 20% off blem receiver sets. Battle Arms Development: Use Coupon Code: LABOR2018 at checkout. Terms: **EXCLUSIONS APPLY** (While supplies last) ***Total amount of required purchase of $200 must be met (not including shipping, insurance and tax). ***This promotion is valid only for purchases ‪from 12:01 AM (PST) on Saturday, September 1st, 2018 until 11:59 PM (PST) on Monday‬ September 3rd, 2018 . Elite Tactical Systems Group: 15% sitewide! Use Code: ETSLABOR18 at checkout. Grey Ghost Precision: Starting today (Aug 30) till September 3 you can get 20% off site wide. Orders over $500 get Free Shipping – FREE hideout with purchase of any component (G19, G17, G43 slide, Cornerstone lower, etc.) – FREE Rifle case with purchase of complete rifle. Palmetto State Armory: Discounts up to 40% off select products. Tyrant CNC: Free Shipping and up to 15% Off. 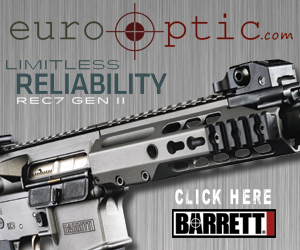 US Optics: ave 15% on any optic AND get a free U.S. Optics Cleaning Kit & Hat. Centurion Arms is offering 15% off all of their in-stock 5.56mm CMR Handguards. The sale is valid from now through Memorial Day and includes the Original Standard, MLOK and Keymod versions. Discount is taken at checkout. “Tyrant Designs just launched their Memorial Day Weekend Sale! They’re offering 10% off everything PLUS Free shipping! First 50 orders get a FREE Tyrant Designs Hat too. Head over to the site now before its all gone! Aero Precision’s Spring Sale features savings up to 30% on select products, including lower receivers, upper receivers, handguards, scope mounts, barrels, spare parts and more plus free shipping on all orders over $99! Gemtech is giving away free silencers…. Gemtech is giving away a silencer a day while at the SHOT Show. If you are attending, visit booth #20521 and sign-up at the Silencer Shop Kiosk. If you are not attending SHOT, stay tuned to Gemtech’s social media outlets or newsletter for something special. Starting on Friday, November 25 and running through the end of Cyber Monday, November 28, 2016, Grunt Style is offering 25% OFF your store wide purchase and FREE Shipping on all Domestic Orders. To save 25% , use coupon code: GETSOME and click HERE to get to the web store. The following is a Black Friday Ad from GEMTECH. GEMTECH has been leading the industry in innovation since 1976, so it’s only fitting we’d be doing the same with our 300 Black Out Friday Sale! Come see why we are “The Professional’s Choice For Decades” with our 300 Black Out Friday Sale, going live Friday at 12 am MST Nov. 24 and ends Monday, Nov. 28. Samson Manufacturing is offering 30% off select items from Black Friday through Cyber Monday.